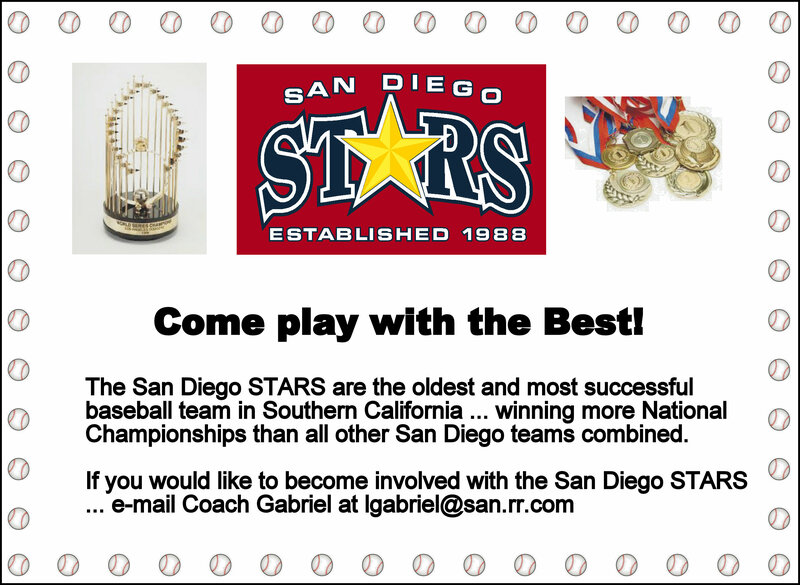 San Diego Stars Baseball Academy | Learn about the San Diego Stars Baseball Academy, Coach Lyle Gabriel and the entire coaching staff. Try out and view photos, rosters or order the award winning video series. •A former STAR was named "High School Player of the Year"
The San Diego STARS are a 501 (c)(3) non-profit corporation. The STARS are one of the oldest traveling baseball teams in the state of California, with teams ranging from 7 to 16 years old. A true travel team, they have played and won in tournaments as far away as Beijing, China and Brisbane, Australia. As one of the nation’s elite boys’ baseball teams, the STARS are always well received as they travel around the country. Winners of 27 World Series Championships, each year the STARS are ranked among the top teams in the nation.